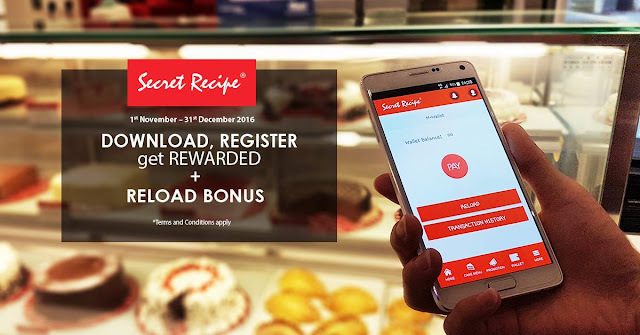 Introducing Malaysia's very first casual dining restaurant chain mobile wallet - Secret Recipe Wallet! Exclusively only at Secret Recipe Malaysia. Offer valid at Secret Recipe outlets nationwide, excluding non-participating outlets. Offer only limited to 1st time download and registration. Valid from 1st November 2016 to 31st December 2016. Offer valid when customer reload through cash reload at outlet cashier counter or self-banking. Harga Runtuh's Pro Tip: do not use this Secret Recipe Wallet if you are not a regular Secret Recipe customers due to the following three reasons. Use cash instead. What is the minimum reload for my SR Mobile Wallet? Is there an expiration date on my SR Mobile Wallet? Can I make partial payment with my SR Mobile Wallet?